Williams, Arizona, is an extraordinary way to enjoy the Grand Canyon! With only an hour’s travel time to the Grand Canyon, you can stop in Williams for breakfast at a Route 66 corner café, grab your souvenirs, hop on a train, visit a wildlife park, take a hike, grab a pole and head out fishing, or simply stroll the streets before your drive to the Canyon. After you have seen one of the seven wonders, return to Williams and enjoy lunch or a homemade shake, shop for custom made leather goods, relax at a cozy lodging establishment, and plan for dinner that will give your taste buds a true western feel. Williams, Arizona, is a charming town nestled at the base of Bill Williams Mountain in one of the largest Ponderosa Pine Forests in the world. In a setting like this, it’s no wonder Williams is considered an outdoor paradise. Only in Williams will you enjoy the beauty of a mountainside town, the best-preserved stretch of Route 66, outdoor adventure to suit every need, a railway to get you to the Canyon in style, an outdoor drive-through wildlife park, a true western setting with cowboys swaggering through town, and a friendly atmosphere greeting you the moment you arrive and bidding you farewell when you depart. 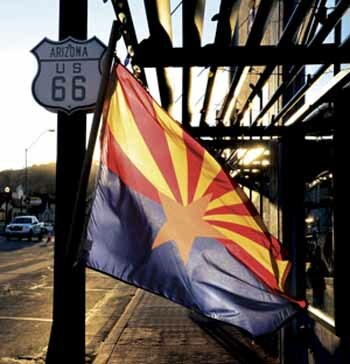 Visit Williams, Arizona, and we guarantee you’ll be making plans to return again and again. Let us guide you with your vacation planning needs—we can help you book local area attractions and can even offer some discounts. Experience Williams—an extraordinary way to enjoy the Grand Canyon!